The Spanish love nothing more than a good party and as you may expect Nerja has numerous events throughout the year, many of which have religious roots but some just for the heck of it. The most important events in Nerja include Semana Santa (Easter), the Nerja Feria which takes place in mid-October and the Christmas festivities which continue until January 6th in Spain. These occasions see numerous events over an extended period but there are various single day celebrations which happen throughout the year and are similarly loved by the residents of the town. Nerja takes part in many national celebrations but like any town in Spain has its own hero’s which hold a special place in the hearts of the locals. San Isidro and La Virgen del Carmen are two such figures which are held in such esteem that each year the town honours them with a flamboyant procession followed by a big party. Besides the religious fiestas though you’ll also find plenty of other things going on with the annual white party organised by the youth department of the town hall, open air concerts, the caves music and dance festival as well as all manner of other things that crop up in the towns summer program. Take a look below and click on any of the events to read more about them. Each year the neighbouring village of Maro celebrates its patron saint, San Antón. This saint, also know as Saint Antonio Abate, is a much celebrated figure throughout the Costa del Sol and is the Patron Saint and protector of domestic animals. The roots of this fiesta can be found in the 17th century with the 'Noche de Fuego' on the first day involving the lighting of bonfires throughout the village and a procession involving plenty of fireworks. The following day see another procession, this time involving the image of San Antón with music supplied by the local band. Pets and other animals are blessed with the day ending with yet more fireworks, music and the preparation of the villages local dish of goat kid or Choto a la Marena. Each year Andalusians celebrate the day that Andalusia became an autonomous community of Spain. It’s a day when residents show their pride in their region, adorning their properties with the green and white flag of Andalusia. In Nerja the custom is for a “Dia del Pedal”. Bicycles invade the town with an official route starting from the Plaza de España and leading all around the town. Our Dia de Andalucia page will let you know what's going on and hopefully answer any questions. Each year to mark the beginning of Lent Nerja enters into carnival mood with four days of events and processions marking the beginning of the six weeks fasting before Easter (Semana Santa). 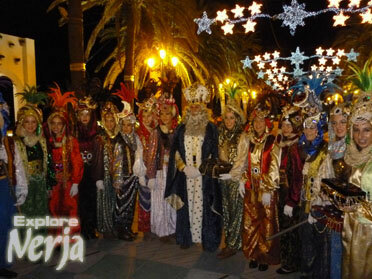 This tradition of the Carnival goes back quite some years and is not solely a feria in Nerja. Much of Spain celebrates similar events in equally extravagant ways, including Malaga City. The four days culminate in the ‘Entierro del Bogueron’ and a fireworks display on the Balcon de Europa. Take a look at our Carnival page to discover more of what it’s all about. This year Residents Day will take place in Plaza de España, near to the Balcón de Europa. Things kick off by around 12 noon with the 30 something stalls set up and ready. Throughout the day there are various performances ranging from live music to dancing. There are also a variety of foods and drinks available from the varying countries represented at the event for you to try. Take a look at our Residents Day page where you'll find pictures and more info. 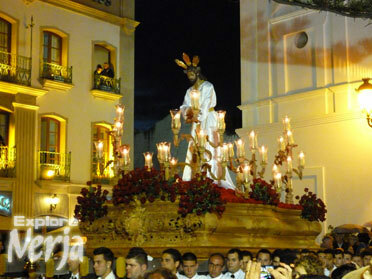 Easter is a busy time in the Nerja calendar. Semana Santa and its traditions are still very popular amongst the community with the Easter week being littered with events. This is a very atmospheric time to be here, particularly if you want to see some of the evening processions. For more information including photos, general information about Spanish traditions and the timetable for the Easter rituals why not take a look at our Easter in Nerja page. The Crosses of May are celebrated on the 3rd of May each year. Although not an official holiday it’s a tradition that’s increasingly popular across Spain. If you’re going to be in Nerja during this tradition find out a little more by reading our May Crosses page. This year Nerja is set to hold its fourth “Noche en Blanco”, a cultural event which will see theatrical and musical performances all over the town in municipal buildings as well as some of Nerja’s most well-known tourist areas. Find out more about what to expect here. The 15th May is a day set aside in the calendar for local farmers to give thanks to San Isidro, the patron saint of farmers and laborers. Like many of Nerja’s religious events this is one that’s grown with the years and now takes on a life of its own culminating in a the inevitable big party. 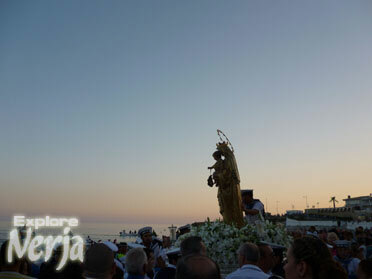 Our San Isidro in Nerja page has lots of background information on what this day is all about. The fiesta of San Juan el bautista (Saint John the Baptist) is a very old and popular fiesta all over Spain and as a sea side town Nerja particularly embraces it. The theme of the rituals associated with San Juan are very much symbolic of purification and are still upheld today. 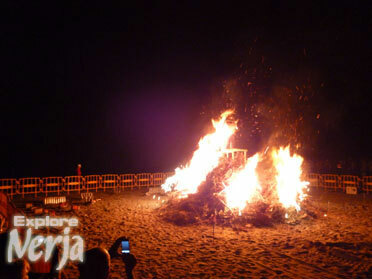 Our San Juan page has lots more information on what you can expect during San Juan in Nerja. Each year much of coastal Spain takes time to thank the Virgen del Carmen, one of the many forms taken by the Virgin Mary. As faithful protector of Spanish fishermen and patron of the Spanish Navy she holds a important place in the hearts of many Andalusians as well as Spaniards all over the Iberian peninsular and the Canaries. 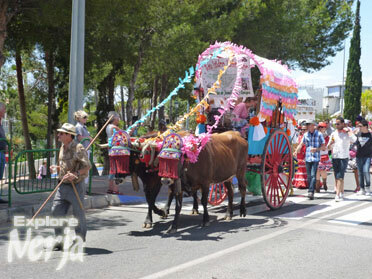 Each year on the 15th Nerja holds a party in her honour and holds the traditional procession the following day. Take a look at our page dedicated to the Virgen del Carmen festival in Nerja for more information about the traditions surrounding this event and what you can expect in Nerja. The Fiesta Blanca is an annual open air party organised in conjunction with the local authority's youth department. This year it’s taking place on El Salon beach where a temporary stage will be erected with the party going on well into the night with music from local groups and DJ's. The only prerequisites are to go along dressed in white and be prepared to have a good time. The event will officially begin at 10:30pm. The three cultures festival in Frigliana is an event that grows in popularity each year with thousands of people visiting this pretty little white walled village during the four day-long event. Find out more about the festival and what it’s all about here. In Maro around 9th September each year, the village celebrates its patron saint, the Virgin of Wonders, with a fair and festivities. The Virgin is taken through the streets of the village in a procession accompanied by rockets and fireworks. As with most ferias and festivals in Spain there is an abundance of music, food and dancing in this intimate little feria, most of which takes place in the village square, la Plaza de las Maravillas. 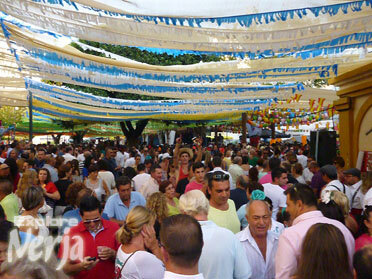 For more information take a look at our page dedicated to the Maro Feria. Held in the second week of October the feria is one of the biggest celebrations of the year in Nerja with processions, singing, dancing, eating and drinking. There are events in Tutti Frutti Square and Antonio Millon on the western side of town however the main body of the feria is found on the site of the car park between the streets Carabeo and Los Huertos which are found just east of the Balcon de Europa. This space is dominated by the fairground rides for the children (and young at heart) and a number of marquees where a variety of activities are held. You’ll find a mix of traditional and modern attractions such as typical Flamenco dancing and shows put on by local organizations. Most of the events that take place during the feria are free of charge although some do have a small entrance fee (often the music concerts). At the heart these celebrations are "La Virgen de las Angustias" (virgin of anguish) and San Miguel Arcángel (Archangel Saint Michael). Following mass on the 9th of October their statues are paraded back to their normal resting place of the Virgin at La Ermita de Nuestra Señora de las Angustias from El Salvador church on the Balcon de Europa. 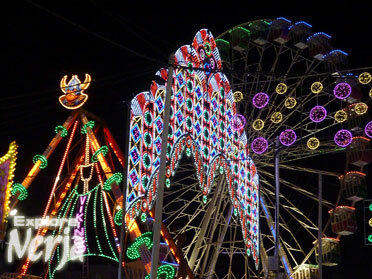 To read more about the feria take a look at our Nerja feria page. Christmas in Nerja is a mix of old and new, with lots of what you'd expect from the period and Spanish traditions mixed in. Although the weather can't be guaranteed there's lots going on with the New years celebrations on the Balcon de Europa and the Three Kings procession not to be missed. 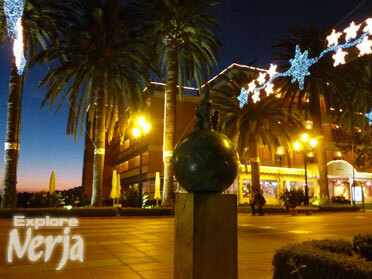 Take a look at our Christmas and New Years Eve page to find out more about Christmas in Spain and in Nerja.